Unfortunately N43 has moved on but he has definitely left his mark here at Nerstane and right across the merino industry. This ram has performed outstandingly in many flocks across Australia and South America. N43 was a trait leader in every Central Test Sire Evaluation site that he was ever entered in. Nerstane 43 as a sire is performing consistently in the show & sale rings. 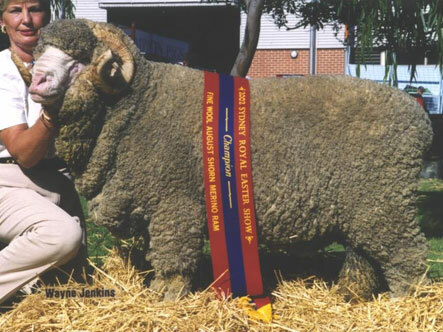 Langdene 4073 is the best example when he was judged Supreme Ram at Bendigo, then onto NSW ram at Dubbo, and then judged Australian Supreme Merino in 2009. This outstanding ram was a son N43 and weighed 144kg at only 17.0 micron. A Nerstane two tooth ewe who was a daughter of N43 was judged Supreme Exhibit at The Sydney Royal Easter Show. This was the first time a junior sheep had won Supreme. Another daughter who was also a 2 tooth in 2008 was awarded best ewe of the show. N412, a son of N43, was judged Champion Sale Ram at Armidale in 2005 and sold for $12000 to Borambil Merino Stud. Borambil continues to use N412 with their top priced sale ram selling for $7000 in 2012. In 2009, N57, who was also a son of N43 sold to Uruguayan clients, Central Lanera for $14000 at Armidale. At the Dubbo National a full brother to N57, N59 topped the sale at $29000. The ram was purchased by a syndicate of 5 studs including Trefusis and Beaufront studs in Tasmania and Eilan Donan, Denholm Green, and Mount Widderin studs in Victoria.